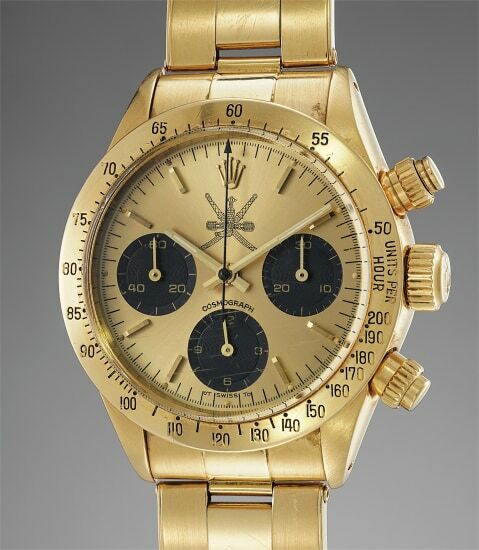 Proudly exalted in the upper centre of the dial of this 18 karat yellow gold Rolex Cosmograph Daytona is a black “Khanjar” - Oman’s national emblem, composed of a dagger in sheath superimposed upon two crossed swords. Such time-keepers were made on commission for the Sultan of Oman, His Majesty Sultan Qaboos bin Said al Said. Presented as gifts to foreign dignitaries, closest officials and, as in this example, loyal staff, many of the “Khanjar” marked watches are cherished by their original owners and passed from one generation to the next. We are proud to offer, on behalf of the family of the Omani Royal Yacht Squadron’s former captain, a unique lot composed of a yellow gold Rolex 6265 and a yellow gold and diamond Corum Admiral’s Cup. Following a highly distinguished career in the British Royal Navy, the owner of this watch left for Oman in the 1970s to assume command of His Majesty’s Royal Yacht Squadron, a position he held for more than a decade. During his time in Oman, the Captain and the Sultan formed an excellent relationship, sharing a passion for opera. This new career gave the opportunity to the Captain to settle and spend many memorable years in Oman with his wife. This watch is a fresh to market, highly original example of a desirable yellow gold Ref.6265. A timepiece of such originality combined with a very personal history makes it a potential jewel in any collection, especially of vintage Daytonas. It was gifted by His Majesty the Sultan of Oman as a mark of gratitude for the Captain’s service. The timepiece has been cherished and was worn only on special occasions, such as the original owner’s 50th wedding anniversary. The “Khanjar” mark supplants the traditional “4-Lines” found under the 12 o’clock marker, leaving the famous crown logo alone on top of the Omani mark. The black colour of the emblazoned symbol perfectly complements the sporty yet elegant black sub-dials, making the bicoloured champagne and black dial stand out even more. At the dial’s bottom, towards the 6 o’clock mark, the desirable sigma designations flanking the “T SWISS T” (tritium Lumes) are found, signifying the use of gold for the hour markers. The case is found in wonderful condition with strong lugs and crisp proportions, demonstrating how rarely the watch has been worn. Their royal provenance, condition, history, and originality make these timepieces a truly unique opportunity. Please note that photos and elements from captain's uniform pictured here are for display only and not part of the lot.